How can I say that the GOP Tax Bill Will Hurt You? Because I will be correct if you are in a fairly large group of Americans, (99.8%) and this so-called “tax reform” passes. Economically, this is not a difficult bill to understand. President Trump, the confirmed and serial liar that he is, is claiming he will not benefit. Its a lie. Taxes: This is a welfare bill for the already wealthy. It reduces taxes for the uber-wealthy, only 0.2% of Americans. For them there is an average $250,000.00 per year reduction in federal income tax. For EVERYONE ELSE, it is a mixed bag. At best, it reduces income taxes for about 38% of middle class Americans for a short period, maybe 7 years. For the other roughly 61%, it is tax neutral, or raises your taxes, sooner or later. The elimination of the Federal Estate Tax is a handout to the wealthy class, and a socially disastrous and cynical move by the GOP. This welfare for the wealthy will permanently embed an aristocracy with the likes of Ivanka and Donnie Jr. Trump, Jared Kushner, and other spoiled trust fund children who do not even know how to work as the decision makers in a government purchased by the wealthy. Concentration of wealth in a few families, along with our currently undemocratic system of presidential elections is taking us ever closer to becoming like the corrupt oligarchy of Vladimir Putin’s Russia, which Donald Trump admires and want us to model and imitate. Healthcare: The reversal of the ACA individual mandate will cost everyone more for health care premiums. This is a little more complicated, but my opinion is based upon the major changes to the health care industry after implementing the ACA. One effect will be that some Americans will once again go bare, and show up for only late stage emergency care. Those costs will be subsidized by higher premiums for everyone else. Another effect is the instability this re-introduces to the already corrupt medical insurance markets. Big Insurance will continue to profiteer by raising premiums due to their professed inability to predict costs. See “Winners and Losers Under Trumpcare” from March 15, 2017 – below on this website. The Deficit: The 1,500,000,000.00 addition to the budget deficit will create economic changes that the former GOP Budget Hawks are ignoring with accounting tricks. This deficit will not be paid by economic growth. Trump blames the amount of foreign aid as the reason for the deficit, which is a lie. The huge additional deficit will make it impossible to reduce the trade deficit, which is another type of deficit. The trade deficit is a problem Trump says he’s going to fix. Again, he is not smart enough for the complex analytical thinking these proposed actions require. The question is, how does the additional budget deficit effect trade? The answer is, it effects trade negatively and reduces the number of American jobs. Here’s the economics of it: A budget deficit creates a need for additional government borrowing. The added borrowing creates upward pressure on interests rates as the government offers U.S. bonds that must be attractively priced to sell. These higher bond rates attract foreign investment, much of it from China’s, India’s, and Russia’s newly minted billionaires. They also drive up domestic interest rates as banks are forced to complete with these bond rates for deposits. These bond purchases then effect the value of the dollar which becomes even stronger. As the dollar becomes stronger, it reduces our ability to produce goods that are competitive on the world markets. Companies that cannot compete globally then reduce their output, and fire American workers, or reduce their hours of employment. We produce and ship fewer goods because the expensive dollar makes our goods uncompetitive. Even if the “tax break” goes deeper than I think it will, the effects of a tax break without federal spending reductions will be inflationary, and cause the Fed to raise the interest rate. Adding capital to the spending economy of the uber-wealthy, and any average Americans who translate a tax break into spending and not savings, add further fuel inflationary pressures. This will cause the Federal Reserve Bank to raise its benchmark rate. So, you lose. No matter what happens, this tax bill can ONLY add to the grossly unbalanced distribution of wealth in the USA, and reduce the meager fortunes and employment of most Americans. It was interesting to read such a wonky OpEd by Doug Badger in the 3/14/17 edition of Twin Cities Pioneer Press, http://www.twincities.com/2017/03/14/doug-badger-have-20-million-people-gained-coverage-under-the-aca/, later reprinted in The Record http://www.recordnet.com/opinion/20170314/guest-view-that-20-million-figure-impact-of-obamacare-often-overstated. He raises interesting questions about the accuracy of the mostly politically sourced data about the Affordable Care Act, or ACA, and the new Trump-Ryan-Bannon-Price Withdrawel of Care program humorously called the American Health Care Act or AHCA. He challenges the numbers tossed around about estimates of who gained coverage under the ACA. Doug’s assessment that the number of individuals who benefited from the ACA may be overstated is one piece of the puzzle that warrants further discussion. While an understanding of the number of people that gained coverage under the ACA, and how many more will lose it under any Republican idea proposed so far, including the AHCA, is essential to planning and to the metrics of success or failure, Doug kind of misses the forest for the trees. Health care is complicated, and not something that lends itself to simplified political positions and silly slogans. It needs thoughtful analysis from many angles. There are so many moving parts including building, operating, and maintaining health care facilities, the location of such facilities, duplication of really expensive equipment for the sake of “being competitive,” the complicated business and clinical systems that deliver care, the training and licensing of the people who are “providers” of care, the health, mental and physical condition of the clients, their method of payment, and so much more. All of this so far has been paid for under the system of “Fee for Service” through the channels of private payments and insurance benefit remuneration. While Fee for Service is not a perfect system, and leads to a great deal of inefficiency, unnecessary duplication of equipment and facilities, and potentially massive overtreatment and profiteering, it secures a predictable flow of cash for providers and health care systems. Deconstructing the “health care system” by looking at any one factor really doesn’t paint an accurate picture unless one understands the system as a whole. “Insurance coverage” is one such factor, and though very important, it has little to say directly about the “effects” of coverage. Whether the number of people who gained some level of coverage increased by 20 million, or something less, is really not the issue. The real issue is what happened in the last seven years when those folks gained coverage. A transfer of wealth in the form of taxes from the top 1% provided insurance subsidies and directly funded Medicaid eligibility for millions of the poorest Americans. To determine what effects that investment had on the system overall requires the analysis of huge amounts of data about each of the moving parts mentioned above, and many more. That analysis is important because it speaks directly to what will collapse when those now receiving coverage lose it, and the taxes flow back into the wallets of the extremely wealthy, which is really all Trump-Ryan Care promises. Let’s look at just two effects, and the benefits derived on a system-wide level from these effects. Many of those who received new coverage under the ACA were unemployed poor or working class poor with marginal employment. Many qualified for either good quality employer based plans under the employer mandates, or an affordable individual plan, maybe with subsidies, from an exchange, or became eligible or aware of eligibility for Medicaid under the exchanges. Suddenly, the whole picture of health care delivery shifted dramatically in participating states. There was new and predictable remuneration infusing into a system that previously was required to provide services for “free.” One effect was emergency departments suddenly had far fewer patients needing to be treated for free, and those formerly lost fees no longer had to be subsidized by private paying patients and insurance covered patients. So hospital and community clinics could actually plan, based upon expected (and discounted) fee revenue, and shift operations by creating more appropriate facilities and systems. Some of them expanded or bifurcated their emergency departments to create spaces designed more like outpatient clinics. Others added new drop-in outpatient services. A second effect was fewer really sick people. Suddenly, people who had never before seen a physician, began seeking care instead of remaining undiagnosed. Some specialty clinics that formerly treated mainly uninsured people in publically owned, university, or not-for-profit facilities, such as cancer treatment centers, are now seeing patients who have a new source of payment for services. This predictability of payment has allowed the expansion of cancer centers and other surgical facilities in participating centers. While the “Fee for Service” model is not necessarily the most efficient or appropriate, it is at least predictable when you can identify the source of payment for every patient and every procedure. The other side of this coin is the sudden loss of coverage looming under all of the Republican proposals so far. Trump/Ryan Care-AHCA is not about delivering more health care at all. It is first a repeal of the ACA, and secondly, a “replacement” piece that is not replacement at all. It appears to be a tragic loss of coverage for some of the most vulnerable people in the land. The loss of funding for coverage is a transfer of wealth from insurance benefits, back to the most privileged Americans, the top 1% of wage earners and asset holders. Whether 5 million or twenty-four million lose their coverage isn’t the issue. The issue is the possible wholesale collapse of the health care systems that expanded under the ACA. Reimbursement for dental services from third party payers has been the one of the most, if not the most hot button issue appearing in dental publications lately. The California Dental Association’s decision to take legal action against Delta Dental is just one shape the dental profession’s response to reimbursement issues is taking. It is a popular stance among dentists, but the underlying intent of preserving fee for service solo practice is destined to fail. The payers (insurance companies, dental benefit companies, and employers) have no reason to negotiate with individual dentists, and no individual dentist matters much in their business models. Delta is the biggest, but not the only payer in the dental benefit business, and their recent experience of difficulty selling anything except low-cost PPO plans is shared by other benefit companies. Most dentists report their costs are rising, and reimbursement allowances from dental benefit companies, including Delta, have not kept up with the cost inflation dentists are experiencing. In fact, many benefit companies are drastically reducing benefit allowances in the face of pressures from employers to reduce premiums, all the while dentists are experiencing operating cost inflation. Watch those curves on the graph and you’ll see a short path to business failure for most owners. It seems apparent that it is swiftly becoming impossible to practice in a solo, fee for service business model. The “insurance independent practice” was quite common only a few years ago. But the lure of benefit dollars was too hard to resist over the last two decades, and at some point growth of employee dental benefit plans and benefit payments to dentists tipped the scale away from the “private payer” component of most practices. Dental revenue grew steadily with the reliable and predictable benefits many employees enjoyed. Today, most practices are highly insurance dependent. The rare insurance independent practice is usually unique in other ways. I have a friend and colleague who owns and operates such a practice. I’ll call him Jim to protect his identity, but he is a real flesh and bones (blood and saliva?) dentist. I’ve known Jim about 27 years. Jim is 60, and sold his original dental practice about 6 years ago at age 54. He worked back as an independent contractor, as an associate for his buyer for about 5 more years, which was his general plan at the time of the sale. Jim’s original intent was to fully retire somewhere between age 57 and 59. As one might suspect, Jim is a very successful dentist, with unique talents in restoring complex cases. He is also a successful investor, has remained married to his first bride, and never had any kids. So he was positioned economically to sell his practice and retire at a very young age. While most dentists plan in their thirties to retire in their fifties, few are actually able to do so. Jim is exceptional. As is often the case, Jim came to love doing dentistry more than ever when he was relieved from the management and ownership responsibilities by his young buyer. He worked happily for five years as an associate, then the buyer’s plans to grow and expand no longer harmonized with Jim’s plans to reduce his time in the office. Realizing he did not want to retire, Jim did something he’s dreamed about and talked about for years. He opened a new practice. The practice has one chair, and one employee. He sees one patient at a time, and takes cash for his service fee no later than the time of service. His overhead is incredibly low, and his net profits correspondingly high. How is this possible? Well, there are many possible structures and business profiles for this model, but Jim’s decision was to share space in a high quality integrated small group practice. He shares space with much busier generalists and specialists in a large dental specialty building, which includes a periodontist who looks after the routine hygiene needs of Jim’s patients. Consolidation of medical practices is nearing an end-stage of transformation of the medical profession. Depending upon where you data-mine, only between one-third to one-tenth of all physicians will remain in truly independent practices by 2014. Physicians are leaving their independent practices like rats abandoning a sinking ship, while hospital medical groups and other health care delivery organizations are snapping them up like sharks in a pod of sea lions. Few physicians have a problem finding a place to practice. The consolidation of medical practices pools resources and creates economies of scale. I predict there will be further consolidation on a national scale similar to the trends in wireless communication. Dentists are not being head-hunted to join groups the way physicians are in this economy. Dentistry is quite different from medicine in many ways. There is no equivalent of a hospital medical group in dentistry, or even the centralizing effects of the hospital itself. Dentistry is delivered by decentralized small enterprises in mostly small office settings. It is the independent business style and small enterprise most dentists wanted when they entered dental school. But the pressures on the small independent dentist are really no different than the pressures on small independent medical practice. So how can independent solo dental practitioners ever effectively achieve the pooled resources and economies of scale that will be required in a world of declining reimbursement? Jim’s small, fee for service practice is one way, but that method will only accommodate a tiny percentage of dental professionals, probably less that 5% if current payment trends continue. The larger integrated small group practice with which Jim has affiliated is another answer, and one that has enormous promise and potential. There are other ways to organize that also hold promise. The purpose of organizing into larger groups is to achieve economies of scale, and to have some traction in negotiating contracts (for reimbursement rates and fees) with managed care organizations and benefit plans. Many local leaders have been surprised and disappointed by the lackluster participation in the regional dental private practice association or “DPA”. This well-established model in medicine seems to be an obvious first step toward intelligent consolidation that could become more than just an alternative to other dental benefit organizations. In the medical model, independent practice associations partner solo and small group practices up to a size than can take advantages of the economies of scale in purchasing, administrative management, and negotiation of contracts with managed care organizations. While there are some organizational and legal hurdles to overcome to assure such independent practice associations of dentists will be able to avoid anti-trust issues, the path is already well paved by medical organizations whose structures could be easily imitated. Other organizations that have been widely used in medicine as alternatives to selling out to a hospital medical group include foundation medical groups, and management services organizations, which are back office management organizations that provide centralized business leadership, management, and support services for a group of practices that each maintain some independence. Both foundations and MSOs hold promise as potential new structures for dentists that would provide for fully engaged dentist leadership, quality evidence-based patient care, comprehensive monitoring of patient and provider outcomes, shared record keeping and data, and the power to influence the revenue side of the equation through negotiated reimbursements. The mission of any new form of dental group must be quality and value. Declining reimbursements will make it impossible for most dentists to practice in a small, independent, solo practice setting. Costs are already too high for current reimbursement rates to keep up. We have seen the first wave of corporate dental practice, and clearly, they are not the answer. Poor quality, undertrained and under qualified practitioners, and urgent “up selling” of unnecessary dental care are not good for the public. So dentists are going to have to get creative with their organizations and business structures very soon to continue their mission of providing quality dental services to the patients of our communities in a business model that is sustainable. My dad is in his mid-80’s and very sound of mind, with a sharp memory. But he also suffers some of the annoyances of aging like failing hearing only partly improved by hearing aids, and a distaste for the fast pace of life today. He is a veteran of WW II and has a small VA mortgage with a low interest rate on his modest townhouse in Stockton CA. VA Loans are a great thing, and usually have advantages such as lower interest rates not available to mere citizens like me. Dad’s income is sufficient to live well, drive a luxury car, and remain in his home for as long as he is of sound mind and body. Dad called me a few weeks ago because he had been hounded by a caller who insisted that he is associated with the VA, and my dad needs to take advantage of a loan interest reduction program. The interest rate reduction programs (IRRL) are a feature of Veterans Loans, and have specific rules. The new rate must be lower unless the old loan was an ARM and it is being replaced with a fixed rate mortgage. Dad called me because he wanted to meet with these folks, even though he had his suspicions. He has a hard time hearing sometimes, and was worried he would miss or misinterpret something they might say. I had my suspicions too, so I told Dad I’d attend the meeting. We met with a young man from Amerigroup Mortgage Corporation a few days later. The meeting was ridiculous. The “agent” first presented his “license” in a plastic sheet protector, and then some “credentials” about the company. This company has no web site, at least not one on the first few pages of a google search. But by following some threads, I found the parent company, Mortgage Investors Corporation. If you click on the tab that says “Click here for Your monthly estimated savings” it just asks for your phone number. When you close that box without entering anything you get one of those annoying “Really, you don’t want to save money” widows that you also have to close. There are complaints about the company on several sites. I had already done the research, and read the complaints before the meeting. The Amerigroup guy’s pitch was exactly like that experienced by other (complaining) vets. He had a 1″ binder he set up like a tiny flip chart, and went through a childishly crude “analysis” of how he could save Dad lots of money. Then he took my Dad’s last loan statement, and made some calculations on a legal pad, and proudly told my Dad he could save him $54.00 per month. “What would you do with an extra $54.00 per month,” he asked my Dad. Dad looked at me and rolled his eyes. He looked at the young man and said, “What is the interest rate, and is it an adjustable rate mortgage, because I don’t want an adjustable rate mortgage?” The answer was of the nature of “Do you want to save money? If so, what does the interest rate and ARM vs. fixed matter…” Dad had asked if it was an ARM when he called to make the appointment, and the company refused to tell him. Turns out it was an adjustable rate mortgage that definitely starts lower than my Dad’s current low interest loan. But it will adjust. Dad asked if he could keep the figures the guy had drawn up on the legal pad, so he and I could later discuss the opportunity and explore the possibility of making a change. He said he could not leave them, because they could be used against the company if we ever sued them, and the estimate was not a promise, just an estimate. So we thanked him for coming, and declined at that point. I stood, went to the front door, opened it an said, “This meeting is over.” He angrily packed up his briefcase and left without even a farewell. The VA’s web site makes no recommendations about where to get your IRRL (Interest Rate Reduction Loan), but they do suggest you interview several lenders and compare. This company doesn’t leave anything to use for a rational comparison. In 2007 this company has it’s CA License revoked, and was ordered by the Commissioner of Corporations to stop business in the State of California. They eventually rehabilitated in 2009, and are back in business preying on elderly vets with young strong males who apparently use intimidation to make the sale. The next evening Dad was over for dinner along with my in-laws, and he received a call on his mobile phone. It was a call center solicitation, again, VERY HIGH PRESSURE, from the same company, Amerigroup. Dad handed me his phone to take the call. I told the saleswoman we had already met with their agent, declined the offer, and found the process to be terribly unprofessional and exploitive. Even after that, she continued to try to pitch me another visit with one of their agents. The only way I could end the call was to hang up as she was speaking. Since then Dad continues to get calls and letters from the company almost weekly. So, beware these characters and others like them. All these types of IRRL products are available from brick and mortar banks in your neighborhood. If you have a VA loan and think you can save on a new interest rate, then take the VA’s advice and get three estimates and loan offers. Any legitimate bank will give you an estimate and illustrations in writing. You can compare them in the quiet of your VA financed home, and talk to your attorney or your friends and family, and make a rational decision that is right for you. Dentists are targets of plaintiffs (actually in Sacramento, ONE PARTICULAR PLAINTIFF by the name of Scott Johnson…) who use the ADA to create an opportunity for a form of legal extortion. Not the American Dental Association ADA, but the Americans with Disabilities Act ADA, which dentists like to refer to as the “AwDA” as if that is clear. OK, I’m sorry for the reverse psychology of the attention grabbing title for this post, but driving to and from my clients’ offices recently, I saw the potential for many of them having this kind of nuisance suit. 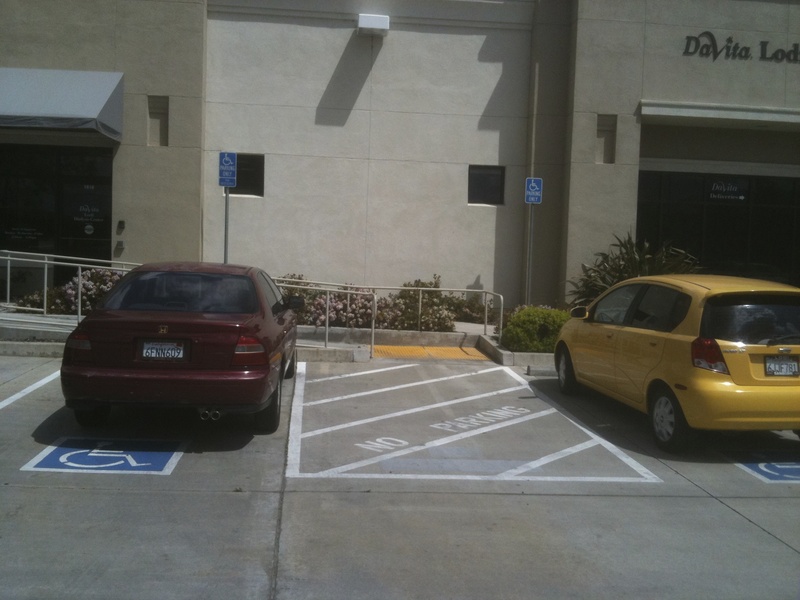 The ADA specifies architectural standards that are mandatory. In 2008, the rule for changed for “handicapped” parking, now referred to as “Accessible” or “Van Accessible” or “disabled” parking. 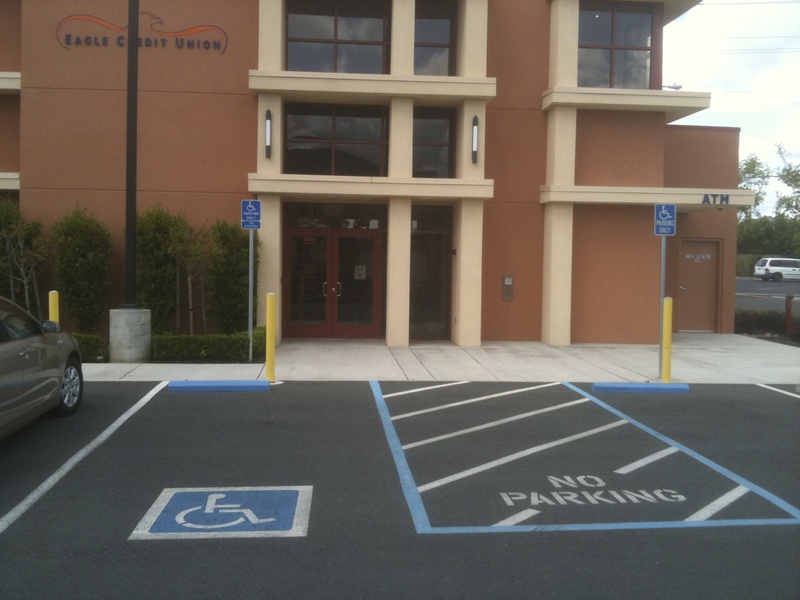 Today, if you have parking in your complex, you need at least one accessible parking space. If you have only one accessible space, it must be Van Accessible. For greater numbers of spaces, your can look at a striping chart available here from the Department of Justice. The disabled plaintiff does not even have to call your office for an appointment, but can do this as a “drive by” infringement on his/her rights. Here’s how it’s done. 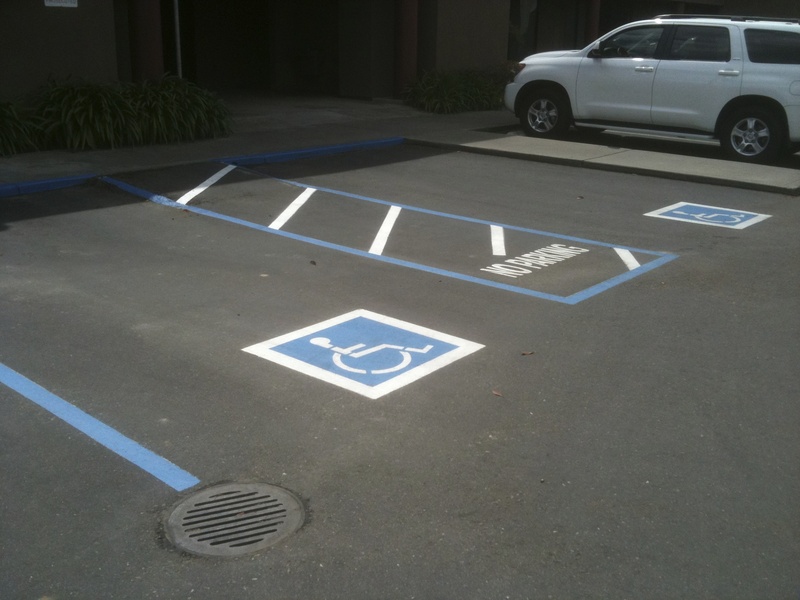 John Doe, the disabled plaintiff, sees your parking lot has no spaces adequately striped and designated with the proper blue signs, diagonal striping, 12″ “NO PARKING” lettering on the pavement, and 96″ of passenger side clearance. Here is a picture of a legally sized space in Lodi. The van parking has the correct width and the corridor is correctly sized as well. Note the “VAN ACCESSIBLE” blue sign on the left. Across the street is another facility in close but not perfect complete compliance. The signage is also correct, but most advisors recommend a blue stripe to identify the no parking zone. I do not think this one is so far afield that it would draw a lawsuit. Since there is no other van accessible parking in the complex, and only these two spaces, this is a potential lawsuit. The plaintiff drives by and discovers that he cannot access the building at all because there is no van accessible space. He sends a letter saying you are in violation of the ADA, and requires you to send a list of your violations and a correction or mitigation plan. Most owners ignore the letter. It is followed by another letter that insists on a sum of money, $5000 to $10,000 to prevent a lawsuit. If you send it, he stops action. If you don’t, he files the lawsuit. A February 2010 issue of the Sacramento District Dental Society News featured several articles about Mr. Johnson’s escapades and has some additional advice from qualified inspectors called Certified Access Specialists or CASp. More information is also available from the CalChamber. Mr. Johnson is a quadriplegic attorney. He apparently has a successful career making a bad name for my second profession, and is making his living suing and threatening to sue business owners. But he is not always successful. Recently a business owner filed a countersuit and won. Johnnie Walker manages a business property at 6500 Watt Avenue in Sacramento. Mr. Johnson had the last word, insisting on a formal inspection after the improvements are complete, but the judge ordered him to pay Mr. Walker’s $5100.00 court costs. Bottom line: Have your property inspected. Contact a CASp and let the inspector start in the parking lot and continue through the entire office. Plan to be in compliance with the ADA and have a certification of your inspection and improvements. A list of Certified Access Specialists is available from Governor Brown here. Thank you for checking this out. I am an attorney with my own law firm, and a professional mediator. I also am a licensed dentist, but no longer in clinical practice. I write in several different categories, including my core topics of dentistry for consumers, dental practice management (for dentists and dental office teams), medical practice management, health care, legal topics including health care law and business law, general business management for closely held businesses (small partnerships and corporations), mediation and alternative dispute resolution, health and fitness, recreation, the environment, and from time to time, travel. A major thread that runs through almost all of these themes is achieving happiness through a life well-lived. Let me know what topics interest you. You can make suggestions here or e-mail me directly at drjay@jayhislop.com. Please subscribe, and let your friends and colleagues know they are welcome too! I am on top of the world in the photo, resting my hand on the wind sock at a remote helicopter landing pad high in the Coast Mountains of Northern British Columbia. That was a little heli-ski trip with Northern Escape two years ago with a group of mostly orthopedic surgeons, and some of their friends. 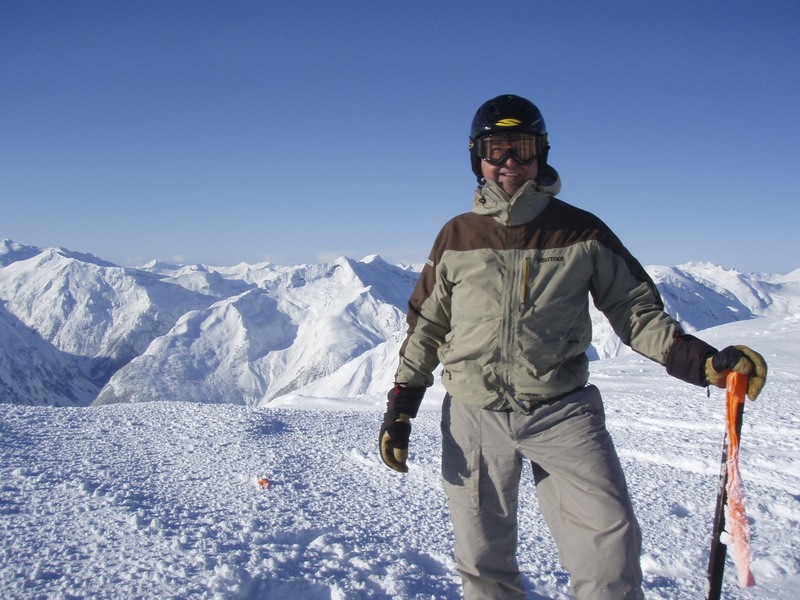 One of my ski pals, Peter Tuxen, M.D. of St. Joseph’s Medical Group invited me along with a group hosted by Bridger Orthopedic and Sports Medicine in Bozeman MT. I posted this photo because it conveys one of my major themes, that happiness is only achieved if your life has sufficient balance. Work is fun for me, but I have my limits. I can enjoy a few 60 hour work weeks each year, but prefer about 36 to 40 hours. Most of us really need time away from the job to fully restore the energy reserves and rekindle enthusiasm for the regular beat of the daily workflow. For me, a few days in a row on some fat skis does the trick. I’ll be posting more photos from that excursion and others under the recreation theme, and blogging about the direct and indirect benefits of a balanced lifestyle. Welcome. I hope you enjoy the ride. Tell your friends. Welcome to Jay Hislop’s Blog! Welcome! Please check back frequently for updates to the blog.